Welcome to Oliver Irrigation Ltd. Unlike some competitors, we are not a franchise company. We are a privately owned and operated company. We will design and install the correct system for your home. Select the correct products to fit your specific irrigation needs. Install your system quickly and without unnecessary disturbance. Provide year round maintenance to guarantee trouble free watering. Our systems are fully computerized giving the customer the choice and the control to operate the system which best suits their needs! Maintenance of the system is only required twice a year, in the Spring and Winter! Oliver Irrigation Ltd. has installed over 5000 irrigation systems. Please do not hesitate to ask for references. 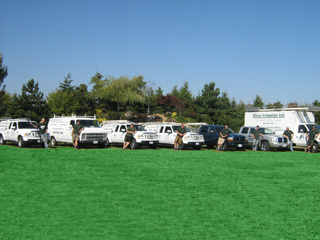 Thank you for allowing Oliver Irrigation Ltd. the opportunity to quote for you. We will be pleased to answer any further questions.